First of all the news I know many of you are waiting for. Book three in the Wanderer series has now gone off for editing. Assuming there isn’t anything that requires significant rewriting I’m hoping to get it out to Beta Readers by mid May, maybe a little earlier. I have to admit this is the hardest part of writing a book. For the first time someone else is getting to see it. All sorts of doubts start running through my mind. Is it as good as I think it is? Is it total rubbish? Should I have spent another five years working on it? It is a little easier this time. Having five books out there, and having had such a fantastic response to them, means I have confidence that I can produce a good book. So now I just have to worry over whether this one matches up to (and exceeds) the others. Thank you to everyone who has reached out to tell me they’ve enjoyed my books or has written a good review. You’ve helped to keep me (mostly) sane right now. I’ve had a great response to my request for more beta readers so those slots are currently all filled, but there are some spaces left for advanced reviewers. So if you’d like to get hold of the book a few days early in return for writing an honest review on Amazon (and anywhere else you feel like) please drop me a line by filling in the contact form. So – that’s the big news, but there are other changes on their way. In May I will be removing Wanderer’s Escape and Wanderer – Echoes of the Past from the Amazon Select program (which requires exclusivity) and publishing them on nook, kobo, apple, smashwords and other sites. And after the success of making Dark Soul Silenced – Part One permanently free I will be looking to do the same with Wanderer’s Escape. And, if I can fit it in, I want to consider the push to get both Dark Soul books into print along with the second (and then third) Wanderer books. Wonderfully constructed storyline. Creating characters that are memorable and leaves you screaming and talking like a nidgit at Jess. Amazing to hear that my books have had that affect – I’ve had plenty of books do that to me. I’m reading the third book in the Tube Riders trilogy right now and all three books have kept me up way later than is sensible. Just finished Wanderer, Tainted Universe on my NOOK. Can hardly wait for the next installment. Do you have a name for it, yet? I live in San Antonio, TX and have been a science fiction fan since I was 11 years old and discovered Door into Summer by Heinlein. I am now 72 years of age. 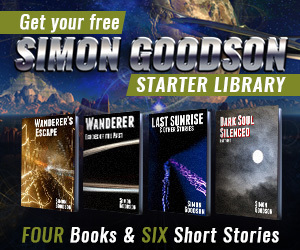 This series is gripping and I am pulling for both the Wanderer and Jess, By the way, I was one of those that read the freebie and was hooked by it. I purchased the next two and will purchase all you write in the series. Thanks for getting in touch, great to hear you enjoyed them so much. It’s great to see the books selling well on the Nook and iBooks – I pulled them out of Amazon’s exclusive program a few months ago which means I can publish them everywhere and more people get the chance to see them. I’ve got a few names in mind for the new book but nothing definite yet. It’s approaching 40,000 words so well underway but there’s a long way to go, and some parts of the story are very much in flux. I’ve had a couple of “oh wow” moments over the past few days where things farther along suddenly slotted into place and pulled the story in new directions, and I’m getting really excited about where it’s going now.